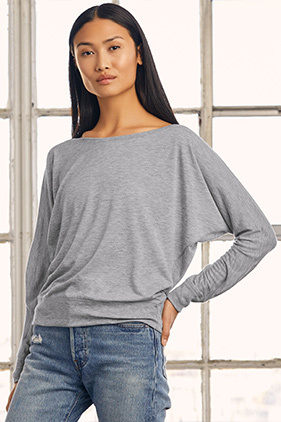 65% polyester/35% viscose, 32 singles 3.7 ounce flowy long sleeve t-shirt. Sideseamed. Relaxed, drapey fit. Rib cuffs and waistband. Seam up center back. Dolman sleeves. Neon Colors*: 65% polyester/35% viscose, 32 single 3.7 ounce.